My sister Caitie is having a baby! 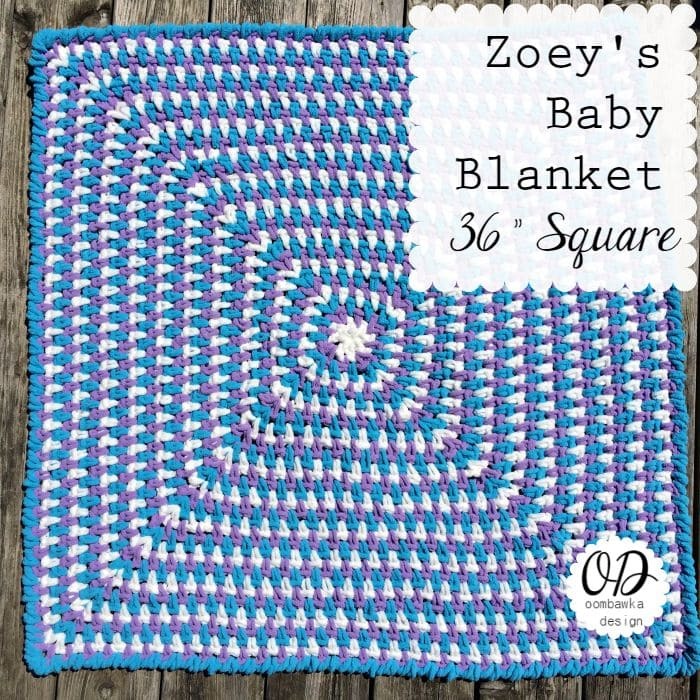 I designed Zoey’s Crochet Baby Blanket Pattern in super soft and squishy yarn. Caitie’s little girl is due any day now and this past weekend we had a Baby Shower for her. 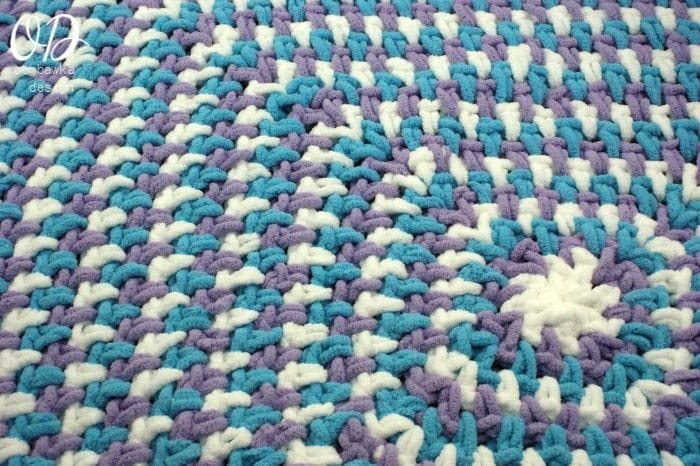 This is the blanket I made the day before the shower – nothing like leaving it to the last minute right? It worked up very quickly (less than 8 hours in total) and I was actually crocheting in the dark (by the light of one lantern) for 4 of those hours because – as my luck would have it our power decided to go out twice Saturday night. 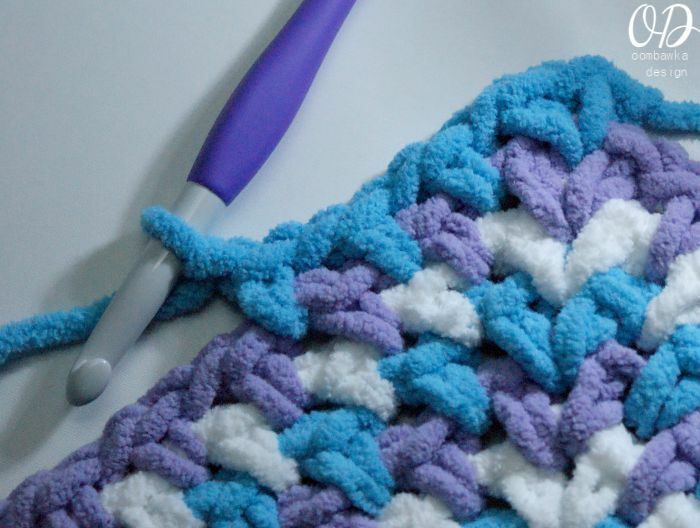 This crochet baby blanket is so soft and squishy! 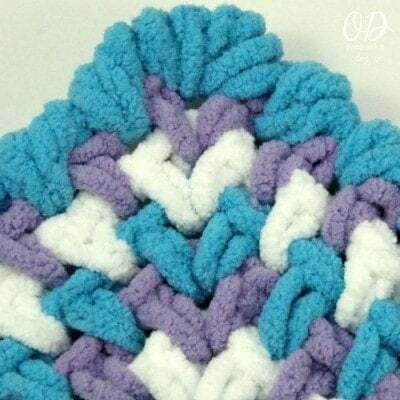 36″ Square – you can continue this to the size you wish – or stop sooner for a smaller blanket; or even to make an Afghan Square. 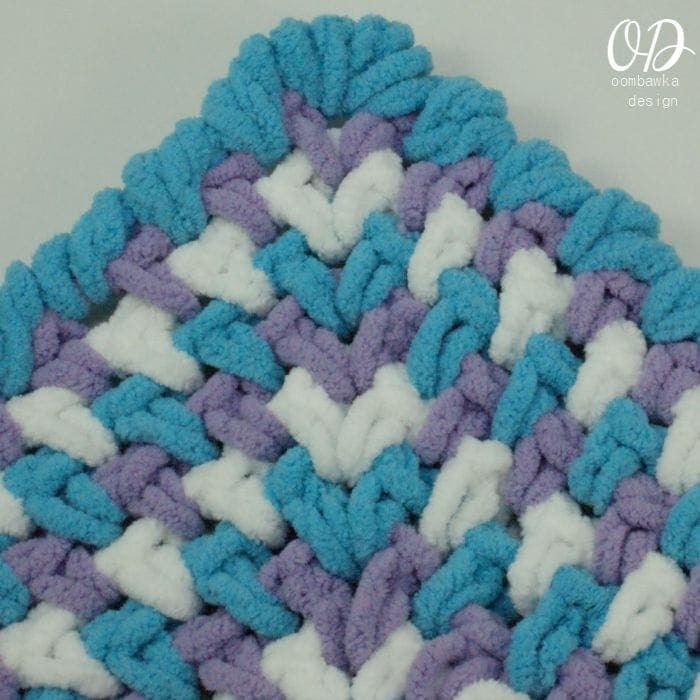 This pattern will work with most yarn and hook combinations; however, it will just be smaller in scale and take more time to complete. This blanket took me less than 8 hours of time to crochet in total including about 1 hour to weave in all the ends. I am a bit over cautious and have to admit to a ‘crochet faux pas’ as at each corner I secured my beginning yarn end and my ending yarn end with a double knot (super tight). I am always worried about yarn ends and baby blankets – so I knotted them and then wove them in multiple times…just in case. 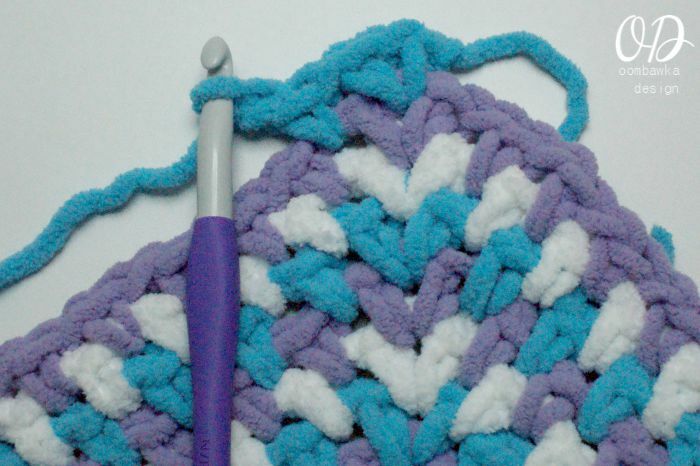 If you don’t want the little bump from the knot – or do not want to break ‘crochet law’ then don’t knot the ends – I just wanted to let you know that I did and the blanket turned out just fine and I have the peace of mind that those ends are extra secure. 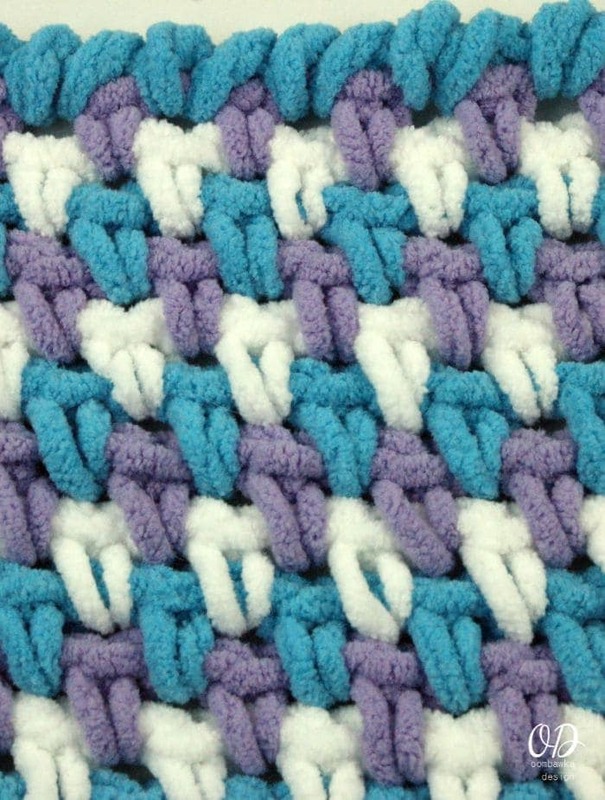 Tweed Stitch and Crab Stitch (Reverse Single Crochet); the Tweed Stitch is also known as the Sand Stitch and as the Linen Stitch. For another blanket pattern and a much more manly option, please check out Dedri’s Manghan design (which I absolutely adore!). 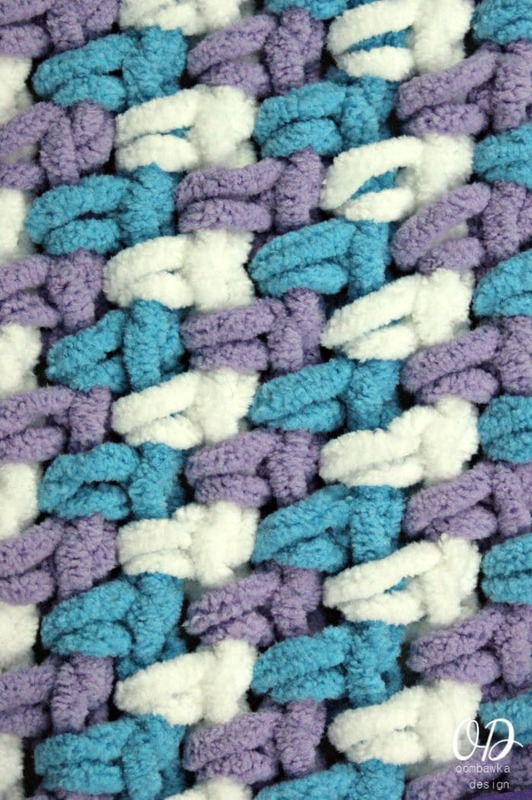 The Linen Stitch Manghan is crocheted using 2 colour repeats and it can be found here: Linen Stitch Manghan. Have you heard it called anything else? 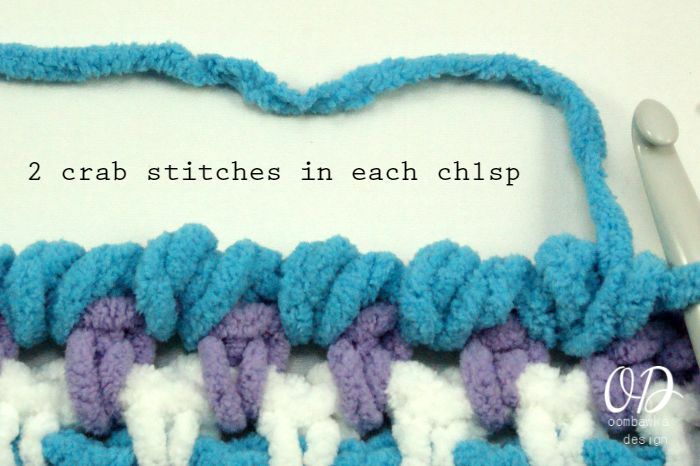 U.S. Crochet Terminology has been used. After Round 1 is complete you will only work in the ch1sps for the remainder of the project! 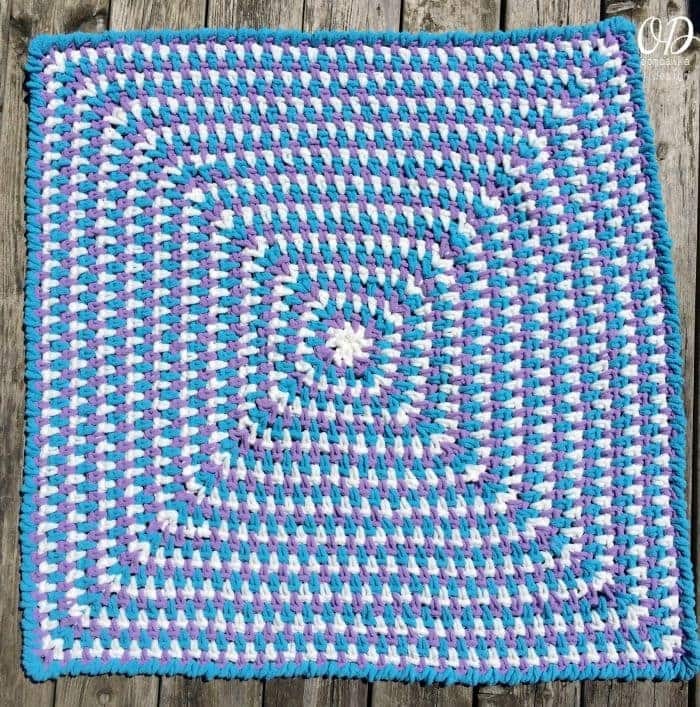 If you do decide to make this, please remember to add the pattern to your Ravelry Queue and Favorites and create a Project Page so I can see your finished photos! 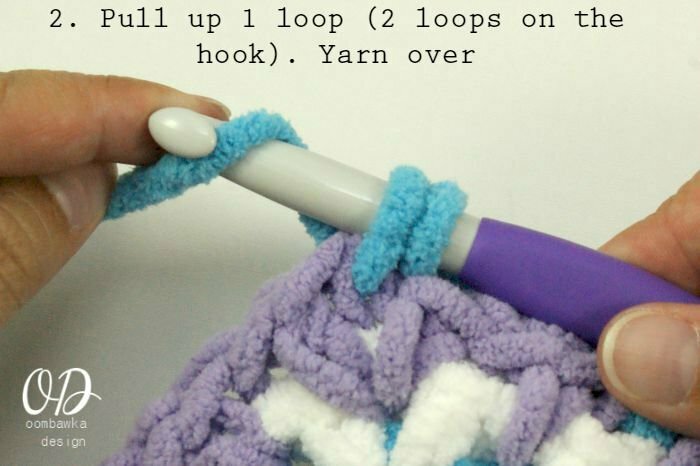 Leave 6″ tails of yarn when you cut to change colours to give you a nice long tail to weave in and secure. If you only want to use 2 colours check out Dedri’s Linen Stitch Manghan Design as it includes a fantastic way to carry the one unused colour; instead of changing it at the end of each round. Round 1: C1: In a magic ring work *1 hdc, ch 1**. Repeat from * to **, 8 times. Finish off. Note: From now on, you will only be working in the ch1sps. Round 2: Beg in any ch1sp. (Join C2 with a sc. Ch 1, sc, ch 1) all in the same stitch. 1 sc, ch 1 in the next ch1sp. *(1 sc, ch 1) 2 times in the next ch1sp. 1 sc, ch 1 in the next ch1sp.**. Rep from * to ** 2 more times. Ch 1, finish off. Note: The corners each have sc, ch 1, sc, ch 1. For all future rounds you will be joining with a sc in the first ch1sp of any corner. I rotated the corners each time so the joins are not all in the same corner for the entire project. 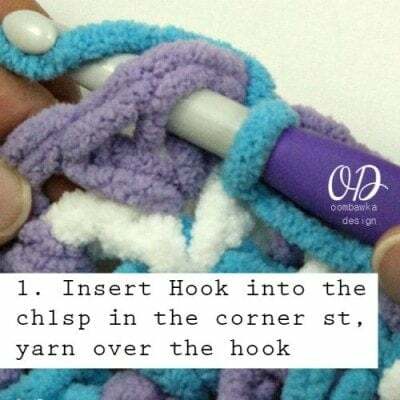 You could instead carry your yarn up one corner; however, this will leave a line showing the 3 colours on the one side of the blanket. Round 3: Beg in the first ch1sp of any corner. (Join C3 with a sc. Ch 1, sc, ch 1) all in the same corner stitch. (1 sc, ch 1 in each of the next 2 ch1sps). *(1 sc, ch 1) 2 times in the next corner ch1sp. (1 sc, ch 1) in each of the next 2 ch1sps. ** Rep from * to ** 2 more times. Ch 1, finish off. Note: You will continue working this same sequence until you have completed 32 rounds. I have written the entire pattern out for those who need it but for those who do not; you will continue to work (1 sc, ch 1) 2 times in each corner and (1 sc, ch 1) one time in each ch1sp around. Changing colours at an alternate corner each round. Round 4: Beg in the first ch1sp of any corner. (Join C1 with a sc. Ch 1, sc, ch 1) all in the same corner stitch. (1 sc, ch 1 in each of the next 3 ch1sps). *(1 sc, ch 1) 2 times in the next corner ch1sp. (1 sc, ch 1) in each of the next 3 ch1sps. ** Rep from * to ** 2 more times. Ch 1. Finish off. Round 5: Beg in the first ch1sp of any corner. (Join C2 with a sc. Ch 1, sc, ch 1) all in the same corner stitch. (1 sc, ch 1 in each of the next 4 ch1sps). *(1 sc, ch 1) 2 times in the next corner ch1sp. (1 sc, ch 1) in each of the next 4 ch1sps. ** Rep from * to ** 2 more times. Ch 1. Finish off. Round 6: Beg in the first ch1sp of any corner. (Join C3 with a sc. Ch 1, sc, ch 1) all in the same corner stitch. (1 sc, ch 1 in each of the next 5 ch1sps). *(1 sc, ch 1) 2 times in the next corner ch1sp. (1 sc, ch 1) in each of the next 5 ch1sps. ** Rep from * to ** 2 more times. Ch 1. Finish off. Round 7: Beg in the first ch1sp of any corner. (Join C1 with a sc. Ch 1, sc, ch 1) all in the same corner stitch. (1 sc, ch 1 in each of the next 6 ch1sps). *(1 sc, ch 1) 2 times in the next corner ch1sp. (1 sc, ch 1) in each of the next 6 ch1sps. ** Rep from * to ** 2 more times. Ch 1. Finish off. Round 8: Beg in the first ch1sp of any corner. (Join C2 with a sc. Ch 1, sc, ch 1) all in the same corner stitch. (1 sc, ch 1 in each of the next 7 ch1sps). *(1 sc, ch 1) 2 times in the next corner ch1sp. (1 sc, ch 1) in each of the next 7 ch1sps. ** Rep from * to ** 2 more times. Ch 1. Finish off. Round 9: Beg in the first ch1sp of any corner. (Join C3 with a sc. Ch 1, sc, ch 1) all in the same corner stitch. (1 sc, ch 1 in each of the next 8 ch1sps). *(1 sc, ch 1) 2 times in the next corner ch1sp. (1 sc, ch 1) in each of the next 8 ch1sps. ** Rep from * to ** 2 more times. Ch 1. Finish off. Round 10: Beg in the first ch1sp of any corner. (Join C1 with a sc. Ch 1, sc, ch 1) all in the same corner stitch. (1 sc, ch 1 in each of the next 9 ch1sps). *(1 sc, ch 1) 2 times in the next corner ch1sp. (1 sc, ch 1) in each of the next 9 ch1sps. ** Rep from * to ** 2 more times. Ch 1. Finish off. Round 11: Beg in the first ch1sp of any corner. (Join C2 with a sc. Ch 1, sc, ch 1) all in the same corner stitch. (1 sc, ch 1 in each of the next 10 ch1sps). *(1 sc, ch 1) 2 times in the next corner ch1sp. (1 sc, ch 1) in each of the next 10 ch1sps. ** Rep from * to ** 2 more times. Ch 1. Finish off. Round 12: Beg in the first ch1sp of any corner. (Join C3 with a sc. Ch 1, sc, ch 1) all in the same corner stitch. (1 sc, ch 1 in each of the next 11 ch1sps). *(1 sc, ch 1) 2 times in the next corner ch1sp. (1 sc, ch 1) in each of the next 11 ch1sps. ** Rep from * to ** 2 more times. Ch 1. Finish off. Round 13: Beg in the first ch1sp of any corner. (Join C1 with a sc. Ch 1, sc, ch 1) all in the same corner stitch. (1 sc, ch 1 in each of the next 12 ch1sps). *(1 sc, ch 1) 2 times in the next corner ch1sp. (1 sc, ch 1) in each of the next 12 ch1sps. ** Rep from * to ** 2 more times. Ch 1. Finish off. Round 14: Beg in the first ch1sp of any corner. (Join C2 with a sc. Ch 1, sc, ch 1) all in the same corner stitch. (1 sc, ch 1 in each of the next 13 ch1sps). *(1 sc, ch 1) 2 times in the next corner ch1sp. (1 sc, ch 1) in each of the next 13 ch1sps. ** Rep from * to ** 2 more times. Ch 1. Finish off. Round 15: Beg in the first ch1sp of any corner. (Join C3 with a sc. Ch 1, sc, ch 1) all in the same corner stitch. (1 sc, ch 1 in each of the next 14 ch1sps). *(1 sc, ch 1) 2 times in the next corner ch1sp. (1 sc, ch 1) in each of the next 14 ch1sps. ** Rep from * to ** 2 more times. Ch 1. Finish off. Round 16: Beg in the first ch1sp of any corner. (Join C1 with a sc. Ch 1, sc, ch 1) all in the same corner stitch. (1 sc, ch 1 in each of the next 15 ch1sps). *(1 sc, ch 1) 2 times in the next corner ch1sp. (1 sc, ch 1) in each of the next 15 ch1sps. ** Rep from * to ** 2 more times. Ch 1. Finish off. Round 17: Beg in the first ch1sp of any corner. (Join C2 with a sc. Ch 1, sc, ch 1) all in the same corner stitch. (1 sc, ch 1 in each of the next 16 ch1sps). *(1 sc, ch 1) 2 times in the next corner ch1sp. (1 sc, ch 1) in each of the next 16 ch1sps. ** Rep from * to ** 2 more times. Ch 1. Finish off. Round 18: Beg in the first ch1sp of any corner. (Join C3 with a sc. Ch 1, sc, ch 1) all in the same corner stitch. (1 sc, ch 1 in each of the next 17 ch1sps). *(1 sc, ch 1) 2 times in the next corner ch1sp. (1 sc, ch 1) in each of the next 17 ch1sps. ** Rep from * to ** 2 more times. Ch 1. Finish off. Round 19: Beg in the first ch1sp of any corner. (Join C1 with a sc. Ch 1, sc, ch 1) all in the same corner stitch. (1 sc, ch 1 in each of the next 18 ch1sps). *(1 sc, ch 1) 2 times in the next corner ch1sp. (1 sc, ch 1) in each of the next 18 ch1sps. ** Rep from * to ** 2 more times. Ch 1. Finish off. Round 20: Beg in the first ch1sp of any corner. (Join C2 with a sc. Ch 1, sc, ch 1) all in the same corner stitch. (1 sc, ch 1 in each of the next 19 ch1sps). *(1 sc, ch 1) 2 times in the next corner ch1sp. (1 sc, ch 1) in each of the next 19 ch1sps. ** Rep from * to ** 2 more times. Ch 1. Finish off. Round 21: Beg in the first ch1sp of any corner. (Join C3 with a sc. Ch 1, sc, ch 1) all in the same corner stitch. (1 sc, ch 1 in each of the next 20 ch1sps). *(1 sc, ch 1) 2 times in the next corner ch1sp. (1 sc, ch 1) in each of the next 20 ch1sps. ** Rep from * to ** 2 more times. Ch 1. Finish off. Round 22: Beg in the first ch1sp of any corner. (Join C1 with a sc. Ch 1, sc, ch 1) all in the same corner stitch. (1 sc, ch 1 in each of the next 21 ch1sps). *(1 sc, ch 1) 2 times in the next corner ch1sp. (1 sc, ch 1) in each of the next 21 ch1sps. ** Rep from * to ** 2 more times. Ch 1. Finish off. Round 23: Beg in the first ch1sp of any corner. (Join C2 with a sc. Ch 1, sc, ch 1) all in the same corner stitch. (1 sc, ch 1 in each of the next 22 ch1sps). *(1 sc, ch 1) 2 times in the next corner ch1sp. (1 sc, ch 1) in each of the next 22 ch1sps. ** Rep from * to ** 2 more times. Ch 1. Finish off. Round 24: Beg in the first ch1sp of any corner. (Join C3 with a sc. Ch 1, sc, ch 1) all in the same corner stitch. (1 sc, ch 1 in each of the next 23 ch1sps). *(1 sc, ch 1) 2 times in the next corner ch1sp. (1 sc, ch 1) in each of the next 23 ch1sps. ** Rep from * to ** 2 more times. Ch 1. Finish off. Round 25: Beg in the first ch1sp of any corner. (Join C1 with a sc. Ch 1, sc, ch 1) all in the same corner stitch. (1 sc, ch 1 in each of the next 24 ch1sps). *(1 sc, ch 1) 2 times in the next corner ch1sp. (1 sc, ch 1) in each of the next 24 ch1sps. ** Rep from * to ** 2 more times. Ch 1. Finish off. Round 26: Beg in the first ch1sp of any corner. (Join C2 with a sc. Ch 1, sc, ch 1) all in the same corner stitch. (1 sc, ch 1 in each of the next 25 ch1sps). *(1 sc, ch 1) 2 times in the next corner ch1sp. (1 sc, ch 1) in each of the next 25 ch1sps. ** Rep from * to ** 2 more times. Ch 1. Finish off. Round 27: Beg in the first ch1sp of any corner. (Join C3 with a sc. Ch 1, sc, ch 1) all in the same corner stitch. (1 sc, ch 1 in each of the next 26 ch1sps). *(1 sc, ch 1) 2 times in the next corner ch1sp. (1 sc, ch 1) in each of the next 26 ch1sps. ** Rep from * to ** 2 more times. Ch 1. Finish off. Round 28: Beg in the first ch1sp of any corner. (Join C1 with a sc. Ch 1, sc, ch 1) all in the same corner stitch. (1 sc, ch 1 in each of the next 27 ch1sps). *(1 sc, ch 1) 2 times in the next corner ch1sp. (1 sc, ch 1) in each of the next 27 ch1sps. ** Rep from * to ** 2 more times. Ch 1. Finish off. Round 29: Beg in the first ch1sp of any corner. (Join C2 with a sc. Ch 1, sc, ch 1) all in the same corner stitch. (1 sc, ch 1 in each of the next 28 ch1sps). *(1 sc, ch 1) 2 times in the next corner ch1sp. (1 sc, ch 1) in each of the next 28 ch1sps. ** Rep from * to ** 2 more times. Ch 1. Finish off. Round 30: Beg in the first ch1sp of any corner. (Join C3 with a sc. Ch 1, sc, ch 1) all in the same corner stitch. (1 sc, ch 1 in each of the next 29 ch1sps). *(1 sc, ch 1) 2 times in the next corner ch1sp. (1 sc, ch 1) in each of the next 29 ch1sps. ** Rep from * to ** 2 more times. Ch 1. Finish off. Round 31: Beg in the first ch1sp of any corner. (Join C1 with a sc. Ch 1, sc, ch 1) all in the same corner stitch. (1 sc, ch 1 in each of the next 30 ch1sps). *(1 sc, ch 1) 2 times in the next corner ch1sp. (1 sc, ch 1) in each of the next 3 ch1sps. ** Rep from * to ** 2 more times. Ch 1. Finish off. Round 32 Beg in the first ch1sp of any corner. (Join C2 with a sc. Ch 1, sc, ch 1) all in the same corner stitch. (1 sc, ch 1 in each of the next 31 ch1sps). *(1 sc, ch 1) 2 times in the next corner ch1sp. (1 sc, ch 1) in each of the next 31 ch1sps. ** Rep from * to ** 2 more times. Ch 1. Finish off. Join C3 with a sl st in the first ch1sp of any corner. 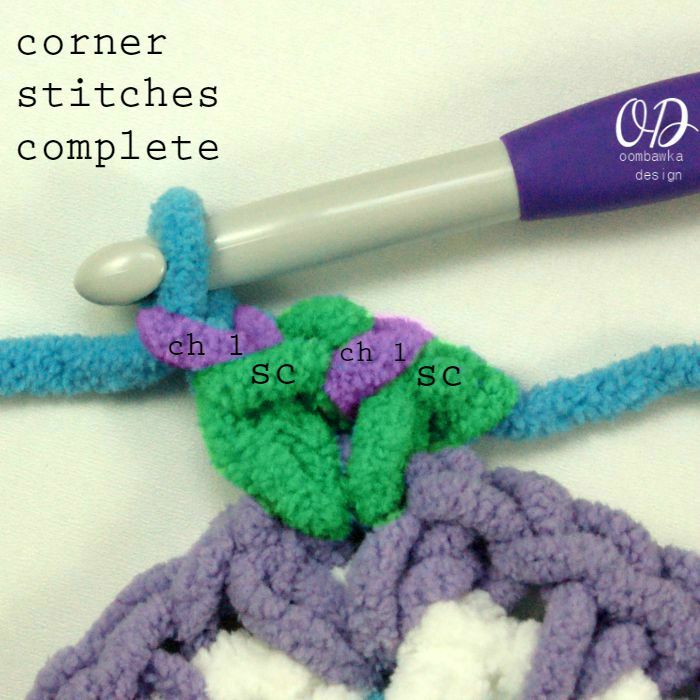 Work 2 crab stitches in every ch1sp around and 5 crab stitches in each corner ch1sp. 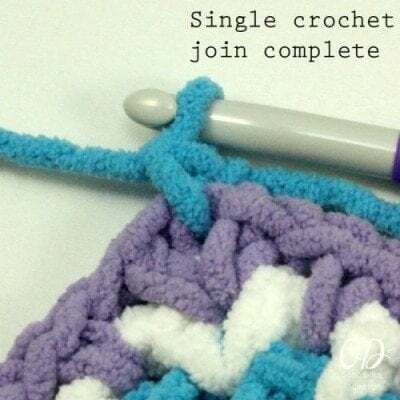 Alternately if you do not want to do the crab stitch you can use single crochet stitches or try this method from my friend Kinga from My Hobby is Crochet for the twisted single crochet stitch. Weave in all your ends well. I am having troubles with the starting of this project.